Bee Series: Bee Proud [J1812] - $8.00 : Yarn Tree, Your wholesale source for cross stitch supplies. Cross stitch pattern by Needle Bling Designs. It's Americana time at this beehive! The flag is flying proudly beside the beehive, with the busy bees buzzing! "Bee Proud," is stitched below the beehive. 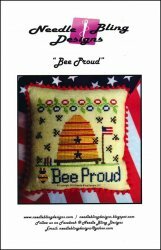 A bee with a red, white & blue hat on is stitched beside "Bee Proud." Stitch count 62h x 61w.